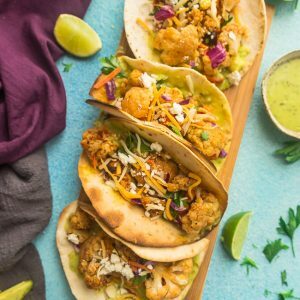 Roasted Cauliflower Tacos - an easy 30 minute vegetarian meal perfect for your next Taco Tuesday. Full of bold and smoky Tex Mex flavors and a tasty avocado cream. Preheat oven to 415 F degrees. Line or grease a baking sheet. In a medium bowl, whisk together chili powder, cumin, paprika, garlic powder, and salt. Place the cauliflower on the baking sheet and drizzle with olive oil, lime, and seasonings. Spread evenly in a single layer. Roast for 20-22 minutes, stirring occasionally during cooking, until cauliflower is golden and tender. Remove from oven and set aside. While the cauliflower is roasting, add the avocado, cilantro, lime, garlic, and salt to a food processor. Process until smooth. Heat tortillas and place a few roasted cauliflower inside. Top with cabbage slaw, avocado, cilantro, a splash of lime juice and/or preferred toppings. Drizzle with avocado cream and top with cheese (if desired).